Python® Super 8R; High Performance, with plastic coated core (standard wires) - Unirope Ltd.
Super-8R is the next step up from regular 8x36 wire rope for overhead cranes with the ability to operate with fleet angles up to 4°. 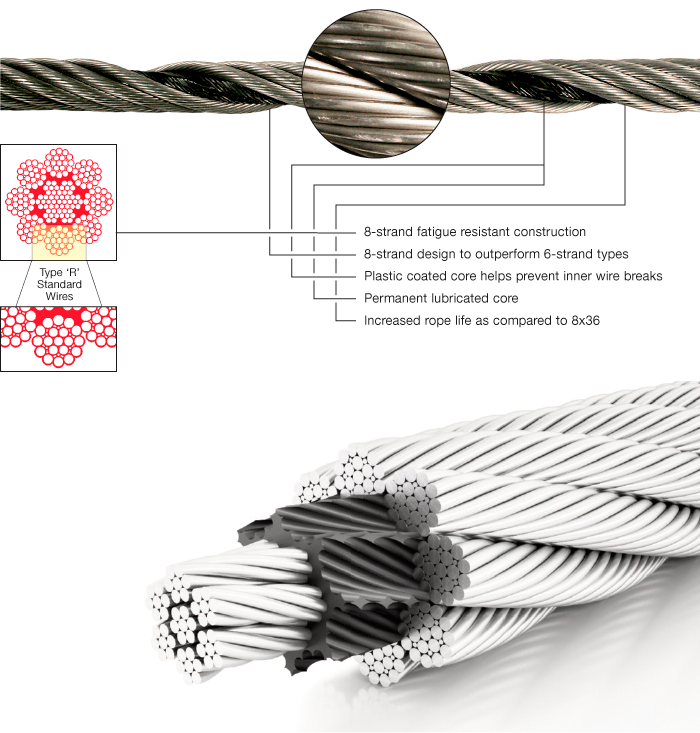 The 8-strand construction provides an excellent combination of flexibility, fatigue life, and abrasion resistance. 8-strand high performance overhead crane wire rope with a plastic coated core. This special engineered hard plastic prevents metal to metal contact between outer- and inner strands and greatly reduces internal, non-detectable, wear and abrasion resulting in increased fatigue life, plus it provides for permanent core lubrication. This rope is not compacted. Python® Super 8 is NOT rotation resistant or non-rotating. Available in right regular lay (RRL) AND left regular lay (LRL). The 8-strand construction provides an increase in contact points between rope and sheave. Less wear of the rope and of your equipment. Do NOT use Python® Super 8R wire rope attached to a swivel. The rope WILL unlay resulting in an unsafe condition. Block Twisting (Cabling) will occur when used exceeding certain lifting heights. Note : The maximum CAPACITY, WORKING LOAD LIMIT (WLL), or LINE PULL of the rope usually is 1/5 of the below stated values. For specific nformation consult the standards applicable to your rope application. 8-strand overhead crane wire rope with a plastic coated core to prevent inner undetectable fatigue breaks. The plastic coating also increases fatigue life and ensures permanent core lubrication. Python® Super 8R is available in right- and in left lay configurations to adopt to the corresponding drum groove direction. Furthermore, using right- and left hand rope on the same crane results in a rope system which is very stable against block twisting.